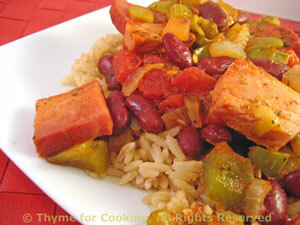 Ham and Spicy Red Beans Over Brown Rice, Thyme for Cooking easy main dish. Chop onions, celery and pepper. Heat oil in large, nonstick skillet over medium heat. Add chili powder and sauté 10 seconds. Add onions, celery, pepper, garlic and sauté 7 - 8 minutes. Trim ham and cut into bite-size pieces. Add ham and sauté briefly. Drain the tomatoes then roughly chop. Add beans, tomatoes, juices, Worcestershire, and herbs. Add green chilies and simmer 5 minutes more. Taste and add anything you like to make it hotter. Serve over rice. Cook rice according to package instructions adding the herbs with the stock.